OHMYGOSH!!! A Win Against a 2000 Player! I still cant believe it.. hey guys, hey guys.. check this out!! Just before this, I was playing PnTinh (1823) and I was so bummed because I had the advantage and let it slip away with one careless move. I was really kicking myself. It was such a horrible experience to see crafty give you a sizable advantage then swing it to a large negative after the blunder. The problem is, I couldn't concentrate nearly long enough. Oh, I start well in the beginning. Analyzing all my opponents threats, but then slowly, slowly, ever so slowly by about move twenty my brain starts to shut down. I drift away into some zone and then there is this little thing where if I stay still for a long while, ants begin crawling all about me. They are in my eyes! in my hands! and I need to get them off! get them off!! by moving a piece. And so I move and I fail. To paraphrase Mr Heisman, if you play real chess 80% of the time, and play hope chess 20% of the time, you are actually just playing at 20% your capability. The chain is only as strong as its weakest link. Anyway, I'm glad that in this game I was able to somewhat maintain concentration. A very satisfying win indeed. You have achieved your best active rating so far. If it wasn't for that stupid draw the last game, I would already be over my all time high of 1801 right now. Anyway, this game is really satisfying from the point of view that my opponent was an 1800 player. I mean, I will never consider myself an 1800 player if all I do is beat up on 1500 players and gorge on their ratings. No no no.. As I've said before, to be the man you have to defeat the man. Who have the guts to play Qxf6? No matter how I try, I wont be able to play like that. Such a sorry state to be in.. But having realized that - I'm now starting to play in.. in a more unhurried style. Concentrating more on scanning for threats than in creation of my own. Of course that doesn't mean I play passively, only that prophylaxis and strategy has gotten a boost in consideration when choosing moves. Bf6?! 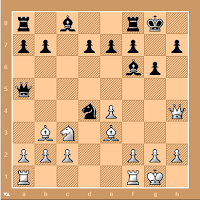 - Two bishop moves at the opening. Wasting time. It would have been better to develop another piece. 1. f4 - The acquisition of space is of prime importance. I now have what Nimzo calls the 'mobile' pawn center. This center will move and crush all! or so I was hoping. He should play to 'restrain' or to 'kill' this pawn center. 2. Nd8?! 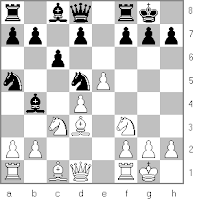 - Although it covers f7, in cramped positions it would be better for the side where space is of a definite lack to exchange pieces so as to give his area 'Air' (Air is not always free in chess). Also the queen should not have been in there. It's getting in the way of the light squared bishop. We must always be mindful on how to coordinate our pieces so they do not hinder their comrades. 3. f5 - The pawns are rolling. Choo choo! - The end is near. Now before I give the impression that I saw everything and everything went according to plan, I and it, actually did not. What bothers me is that I only see possibilities after moving. It shouldn't have been that way. It should be that, I should see before I move the contours of things which is to come. But no, mostly I go 'hey wait a minute! I can do this..' when the position is already revealed. Still, at least I found some of the good moves. But things can be better..
Now, let me just say I totally understand his position. And there are no hard feelings on my part. However, I think blunders are part of the game. I've blundered my fair share and took it in the gut like man.. rawr! bishopspectre: yeah, i'm sure you won't accept a takeback. especially since you were losing. mantakaya: would you be satisfied if i allowed a takeback? bishopspectre: well, if you feel cool winning like this. Ok, so the world is flooded, and what do people like me do when faced with this situation? - I just played 8 hours of chess.. har har.. It wasn't so much as the loses, what gets to me is that I just studied so hard just before playing. I went through entire chapters of 'My System', did some tactical exercises, and basically pumped myself up to play - all to no avail. In order not to get so down, I just reminded myself that everyone goes through such things and that tis part of learning. Anyway - it was good that afterward I was able to play this game. This time, I forced myself to go slower. I literally walked away after some moves just so I can restrain my hands from moving the pieces. And then after that, I played with someone who told me that he is a reader of the blog. Oh hey 'IrishGussy'. Lets play again sometime. Can I safely take the e-pawn? And which knight? What I was most afraid of was that after Nfxd5 then Qh5 with fantastic pressure. In the end, after everything, the game went into an endgame which I felt I should win if I just carefully and avoided forks. Oh, is a queen vs knight ending a draw or a win? I think whats wrong is that apart from moving too fast - I think I'm moving slow enough and yet FICS timestamp indicates I'm doing just shy of a minute per move, far too fast.. - what's wrong is I am not able to retain what I just studied. I mean all those chapters I read was just a distant echo when I'm already in the board. Wonder how to retain the knowledge better and apply practically. As to tactics, what about your earlier realization that tactics grow on trees? Why try to set them up? Keeping the pieces active should be enough for them to appear regularly. On the other hand, maybe it's different when you really are an attacking player. It is true that tactics grows on trees at my level. However, as one proceeds to play stronger and stronger opponents, more sophisticated tactics is required. 1800 and above players rarely falls for a simple fork. Or perhaps it is more accurate to say that the tactic was there all along but I could not see them. Anyway, rather than waiting for some weak move of the opponent wherein something like a skewer suddenly shows itself, you can also attempt to bring about positions where large scale tactical operations are possible. For example, the classic bishop sacrifice. A sacrificial attack that has become my personal favorite. It doesn't always succeed so I could not say that its just a simple trick. I've lost quite a few misplaying the attack, but yet, learning it has been one of the things that makes me say I'm a better player now than I was then. If a little slower in calculation. Did you know that i've played my ipod computer perhaps a hundred times and won just two? 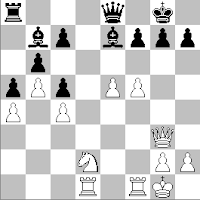 One was involving a queenless middlegame, and the other win was with that bishop sac. Its really sweet. Well, the point is if you've read this far is that by placing the pieces 'just so' you can invite tactical operations to come forth. Here was the critical position of my last game. The bishop being placed on d3 was a very deliberate attempt to setup the classical bishop sacrifice. Well anyway, having said that - things like this is great but I also need some other things too. Its not that I don't want to concentrate on tactics, its just that.. its boring just thinking of the same thing over and over again. I want my chess to have some logic. To have some strategy, to have some prophylaxis, to have something.. else. So confused on what to do next.. I have so many things I want to study.. and yet don't have the time for them all. So I start on one, but another will catch my attention and so I keep going in circles.. I have 'Starting out: Pirc' and 'Winning with the Scotch'. Not to mention a few resources about the Moeller attack I wanted to read more about. It is perhaps in my nature that I want to end games 'at once' that I continually search for trips and traps. Particularly in the opening phase where such things are common. I have '303 chess puzzles', just ordered 'chess cafe puzzle book' and the seminal 'Art of attack'. The problem with puzzles is that you don't really learn how to play good moves. Sure you recognize things if they were staring you in the face, but setting up tactics requires a more elaborate touch. Although the art of attack kinda teaches you such things. Some of my wins were taken straight out of the book so to speak. But well, I've been studying tactics all my chess life it seems (Not that I'm good at it). I feel as if it has grown stale. I want something new this time around. Though I just cant neglect this. It is the one thing good in my game. Always wanted to study pawn endings. There had been times when I should have won a pawn up game and just didn't know what to do. I also have 'Turning advantage into victory chess'. Just read the first game in it and I learned about how to use the opposition already. Careful study of this book should be good for my chess. I feel I need to include this. I've been going through this book again and what do you know. I learn something new again. Well, not new but.. I grasp the theory better than when I first read it. A whole gamut of books have I. It is there in the corner even now. I will not list them all. It is miserable to have memories of me poring over them and it not really having an effect on my game. But perhaps I'll make an exception and re-read 'Simple Chess'. Anyway, there it is. A whole lot of things to study and no time to do it all. It would take years just going through my present collection. Not to mention the other books I wanted to order from Amazon. And also, I'm secretly afraid that even if I did study all of these, that it wont matter a lick. After all, this kind of thing has happened to countless people in ages past. I would not be the first person to plateu. But I sure hope not..
Due to work I haven't had the time to play lately and when I did, this monstrosity happened.. Really.. 5 moves.. really!? At last!! - 1706 - Yay! 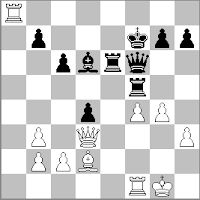 And here, it turned out that the move I was so afraid of - Rd2+ was not possible as the file was blocked by the bishop.. duh! I'll probably hate myself if I lost this game..
100 more points and I am back.. Here is a game I annotated. I wrote what I was thinking during the game and the variations that I was able to comprehend. You'll be very surprised I think just how much variation I was considering in a game. It was really.. skimpy to say the least. I'm having trouble meeting d4 with d5. I always seem to get a cramped game and it is not uncommon that the games ends with my light square bishop not moving from its spot. Plus the fact that I have in my possession - "Starting Out: The Pirc/Modern". The last chess book I bought before I went into my hiatus. So now I'm starting to use this opening against both e4 and d4. I must say that the character of the games I get is very different from what I'm used to. 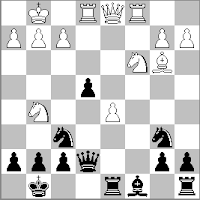 The black position seems compressed.There are no sudden skirmishes and you have to wait for your chances. On the other hand, learning all about pawn breaks and how to counter a pawn center with pieces is also something new. It could only improve my chess if I learn these things. I seriously considered Ng4 here. It didn't appeal to me. It seems that he will take the d6 pawn anyway so attacking with the Knight seems just a waste. Although I at least had another 'candidate' move. Often I would only have one - the seemingly obvious move. So finding an alternative is a happy occasion for me. He is targeting the vulnerable f7. The threat that I saw was Ng5. I can counter that with e6. No problem at this point. 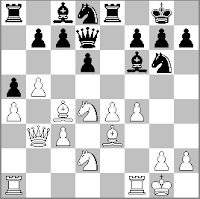 But I also considered Qc7 attacking the bishop. But if the bishop moves to say - b3 then the idea behind Qc7 is lost. Although Qc7 is the normal home for the queen. But I feel that it is needed in the king side. dangerous so I opted to castle instead. Besides, I had a defensive resource up my sleeve which I played the next move. Ha! I was expecting something like this. Now Ne5 stops him dead cold. GASP!! I didn't see this. Now I'm under pressure - h5 will be lost. Then his knight will come back to g5. Just terrible. The question now is - do I have to save it? The answer is - I felt i must. Otherwise it would have been the height of inconsistency for me to have played g5. 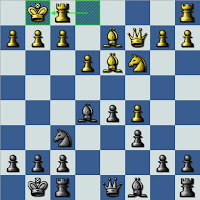 And he wouldn't have the cojones to sac a piece for two pawns and the attack would he? Mate in h7 is threatened. I admit that I didn't see that coming. I was analyzing what will happen if he sacs the knight. I didn't see any mating threats with queen and bishop so I just played g5. But it turned out he sac'ed the bishop. Now there is a threat of mate. One of the things to look for when sacrificing is the presence of the opponents pieces. If there are two or three that can get in the vicinity and participate in the defense then it is usually not a bright idea to do unclear sacrifices. In this case I had two bishops. A tough nut to crack. I cant move f5. He will fork, I saw this much. But then looking around I saw I have a check. So I gain valuable tempo. I can do f5 after all. I can't find any other move apart from this. Some other move like Qa5 to do Qd4+ doesn't seem to do anything at all. The expected fork. The expected check. If he did this, I was intending to sac the exchange just to remove that pesky beast. move I didn't think it registered on his consciousness at all. It is all over now. The rest is of no interest. I really have to get better at looking for trouble. I didn't foresee the reasonable replies three times. Reasonable is the keyword here. It would be one thing if it was some deeply laid trap, but its quite another to be blind to moves that in hindsight, I would have done too. Although me finding another candidate move no matter how simple is good, and there are some variations that I did see. Wonder how much analysis other players do OTB. Do they really have reems of variation floating in their head crafty-style? I am starting to be really aware of the role fast development affects a game and how ta few empo loss is usually fatal. For example, in this game that I lost; I shilly shallied and he got extra turns and it was all downhill from there. I thought I could maintain the pin but it was just a mirage. It was better to lose positional advantages than to lose time!! And - Can't wait for my book to arrive. I ordered 'My System', Fishers 'My 60 greatest games', 'The art of sacrifice' and 'Chess cafe tactics book'.. I can fell my ELO expanding already from thinking about all the learning I'm about to receive.. - Mwahahahaha! I seem to be losing my battle against blunders. Full queen up - Yuck!!! And yet, I then turn around and defeat two 1800 players in fine sacrificial style. Game A - Bishop sacrifice - I blundered twice and yet a win. The thematic bishop sacrifice at h7/h2 is becoming quite a favorite of mine. I've been able to do it three times now since then. One was the sole win against my i-pod chess computer! Each time, it gets easier than before as the lines to calculate takes on a familiarity. I really recommend the 'Art of Attack' to anyone interested in sacrificial chess. 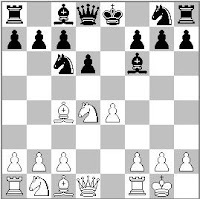 Extreme familiarity thematic attacking patterns and the common defensive and offensive maneuvers that occurs during such attacks could take your chess into heights previously unimagined. Not to mention sometimes, when you are losing, a sacrifice can help turn the tide. As in this game, I was on dire straights actually. I lost the exchange and well, it was a good thing he fell into the trap, not noticing what I intended till it was too late. Game B - Kingside attack - A nice calculated attack. I foresaw most of the lines. This game was nice. I was attempting to implement Nimzowitsch's teaching about development, Namely - loss of time is to avoided at all cost. I henceforth will not back down any of my pieces and avoid exchanges if it means loss of time. I've lost quite a few games because I fell behind in development. I was always trying to gain the bishop pair and would take torturous maneuvers just to preserve them. As Nimzo said - "if chess is like a race how foolish it is to stop and rub your nose while in the middle of it." "How undemocratic for instance, it would be to let one of your officers go for a long walking tour, while the others kicked their heels together at home and bored themselves horribly. No, let each officer make one move only, and... dig himself in." I've previously resisted on buying this book. After all, I have tons of books already on the middlegame. Including what I think is the best of them all - "Simple Chess" by Michael Stean. I mean, what can someone who have long ago turned into dust teach me that more modern authors could not? But lately, I felt as if I needed something new. To understand positional chess so to speak. There have been times when I needed to formulate a plan. All is well if the game proceeds along some lines I know well.. e.g. 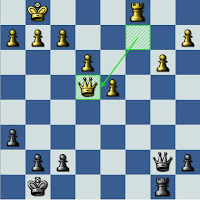 The opponent king is stuck in the center - so open lines now!, etc..
Fortunately, I recently I got a PDF copy of 'My system' and I couldn't stop laughing. Its a very funny book. The only real thing I don't like is that people "re-translates" it because it is "too hard" to understand. It is a very bad thing to do I think. How would you like it if someone put words into your mouth because they couldn't understand what your talking about? I'm aware the printers of the book try to reach a mass audience, but poor Mr. Nimzo must be rolling on his grave right now. I mean, would you try to dumb down Shakespeare? Or if you for example, saw a work of art like Picasso's "Jacqueline a Mantille Sur Fond Rouge" would you perhaps add a little bit of color here, a red dash in there, a tiny pink blot somewhere so people can "understand" it better? Anyway I'm off to search for the edition as close to the original as possible. Looking around the board and casting glances to look for trouble takes a lot of power(?). Although I hesitate to call it power, I am after all just sitting around. But whatever it is, constantly thinking about tactics and the position is draining it. Somewhere deep in the game, I started to feel this pressure in my cranium. Like a heavy load that settled on my head, I half expected to see blood pouring out of my nose. It is not hard to check for every capture, threats or checks. What is hard is implementing it every move for the entire game. For example, the game was 40/40 and lasted for 28 moves and in my estimation me and my opponent took over 80 minutes to complete the game. How to continue the attack? And it was a critical juncture of the game too. But I started to slip into a kind of haze and started to miss things. Throwing the game to chance so to speak. There were a lot of things I missed in here.. seeing them only after I had made several more moves. Of course I was fortunate that my opponent didn't see them too. But I have a feeling that a stronger opponent, say someone in the 1800's wouldn't miss such things. I won but I really have to play better than this. It is not the same as losing, not quite but close. But I have an idea - can this actually be a weapon? Can I inflict positions requiring massive calculation on someone hoping they'll crack and start to miss things? This is assuming of course that my own stamina is up to the task. Comparatively, I saw more threats and it did seem as if I prevented a lot of things from happening. 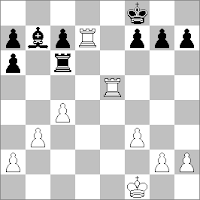 For example, the move 11.Bg2 was prophylactic in nature. h3 was weakness that he could attack. Perhaps not immediately but in a move or two, it could have happened. Or as I've said, I saw too late. 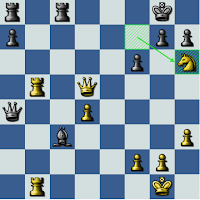 It was fortunate that my opponent didn't play Nd3, and in combination with maneuvering his other Knight. e.g. 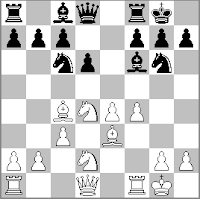 Nd7-Ne5 or maybe Nd7-Nc5 my rooks would have been prevented from moving into the D or F file and he would have a nicely posted knight in there. It might have been temporary but in the interim it would have posed me some problems. Did I see this? Only when it was too late for by then my rook have occupied the files. There are particular moves I don't see, a form of 'blindness' I seem to possess. The correct answer was Ng5. But I looked and I looked an all I can come up with is Nd2. Now why is it that I can see Nd2 but the possibility of Ng5 escaped me? I didn't even consider it. It was as if the move was non-existing. A totally alien concept that it didn't event register though I must have looked at this position for close to ten minutes. This move and moves like this seems to reside on a NULL zone of my mind. Well, at least there was an improvement. Here's to hoping that constant practice will enable me to lengthen the time I can concentrate on the board. Perhaps if I can do an hour of uninterrupted thought, I can be satisfied.